The limestone ledge over which the waterfall flows is an integral part of the history of the park. The limestone, used as a source for a type of cement, was the reason for much of the early activity. It is the source of many embedded fossils that are studied by students at UWM and elsewhere. It originally was a shelf running from the current waterfall to beyond Port Washington Road and formed a natural dam which caused flooding upstream. It was removed in the 1930s by blasting out the rock with explosives. A man-made dam was then constructed that replaced the natural dam. The dam was closed in summer to form a pond upstream for recreational purposes. That dam was later removed in 2018 and the river now runs free in this area. ​in 2008, ROMP (Residents for Off-leash Milwaukee Parks) and the Milwaukee County Parks System campaigned for funds to create additional dog parks. This resulted in the opening, a couple of years later, of the new DEA (dog exercise area) in our park. This 3 acre fenced in DEA, located in an area with trees, benches and a separate small dog area, has proved quite popular with dog lovers. Permits for its use are issued for $25 per year. This portion of the park, until it was re-purposed as a dog exercise area, was a dump for vegetative waste in the parks. It was graded, trees were planted and it was surrounded by a fence. Its presence reduced considerably the number of dogs running around off-leash in other parts of the park. An annual celebration, “Barktoberfest” was begun in 2011 to bring together dog lovers and beer lovers in the Beer Garden. This popular event continues to be held every September. Compared to larger bodies of water, the Estabrook pond may seem like a small scummy puddle. However, it is surprisingly diverse and dynamic, even more so than larger bodies of water. Dug out in the 1930s as part of the landscaping of the park, it was left relatively untouched, except for sporadic herbicide treatments, last used in the 1990s. For a time the pond had been stocked with trout fingerlings originating from the program that raises fish within the department of corrections. In recent years it has become a spring fishing spot with fish stocked annually (sometimes) by the county parks department. Over the years, local biologists have seen this pond as a special place to study aquatic biology. The advantages that the pond provides by being unconnected to other bodies of water turn it into a unique and accessible living ecosystem. The pond had been studied sporadically over the past 30 years by UWM botany and limnology researchers. 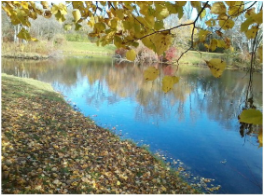 But then, in 2015, UWM biologist John Berges received a grant from the National Science Foundation to study the pond and its processes to gain a greater understanding of aquatic ecosystems. He and his students have collected weekly samples to monitor nutrients, as well as using sensors in to constantly monitor the the temperature and light received by different regions of the pond. Dirt trails have a long history in the park. The old trail along the riverbank probably existed in some form before the Europeans arrived in the area. This trail runs from the corner of Port Washington and Hampton paralleling the river south to Capitol Drive where it connects to a trail that continues south to North Avenue. The trail is heavily used by hikers, birders and runners. Because much of this trail is along the river bank, it is subject to periodic flooding which makes the trail unusable and causes erosion. The Milwaukee River Greenway Coalition has a goal of establishing a hiking trail available to the public on both sides of the Milwaukee River from the North Avenue dam site to Silver Spring Drive. As a member of the coalition, FOE has been active in constructing a sustainable new trail that will not flood on the side of the bluff paralleling the river. The Estabrook Park segment was completed in 2015. In 2018 the trail was extended by going under the Port Washington Road bridge and the I-43 bridge. It continues along the river in Lincoln Park to the bridge that crosses the river on Hampton Avenue. Access to the trail in Estabrook and the river is provided by a number of stairwells which are undergoing repair under FOE sponsorship as well. It is anticipated that the completion of all restoration of these stairwells will occur in 2019. There are also two paved bike trails that parallel the River trail. These are part of the Oak Leaf trail supported by Milwaukee County that continues both south and north of the park. There is a straight portion that continues north along an old railroad right of way until it eventually connects with the Ozaukee Interurban Trail. The other is a curved trail that runs through the heart of the park until it eventually connects to the trail in Lincoln Park. ​Most people who come to the park do so for attractions other than nature. Yet the natural areas are rich in native flora and fauna. These natural areas are mainly in a strip near the river and in the several ravines draining into the river. There is also a strip to the east of the road with many Oaks and Birches. The most striking thing is the presence of large native trees near the river. These include several striking Red Oak and Bur Oaks. The park is also known for its Black Walnuts, Tamaracks and Sugar Maples. Other common forest trees are Paper Birches, Ashes, Black Cherries and Basswoods. The understory contains native Dogwoods, Witch Hazel, Wild Plums, Elderberry, Chokecherry, and Black Raspberry. However many of these have been crowded out by the invasive Buckthorn and Honeysuckle. Most of the vines draped over the trees and shrubs are bird friendly native grapes with a smattering of Moonseed vines and non-native bittersweet. Fortunately the Buckthorn has not affected the ravines in which one can find a profusion of spring wildflowers whose richness is striking. In addition to the common violets, trilliums and trout lilies, there are a number of more exotic flora such as Red Trilliums, Shooting Stars, Marsh Marigolds and Skunk Cabbage. In all there are 31 different species of these spring ephemeral wildflowers. The fauna is not observed as frequently, but includes the usual mammals consisting of squirrels, rabbits , chipmunks and woodchucks. Less common, but still observed from time to time are whitetail deer, beaver, foxes and even coyotes. The park is also a superior birding spot with many migrating warblers and other birds passing through the park in the spring and fall. The river attracts many waterfowl, both migratory and resident, in particular Canada Geese. These have become ubiquitous in the park and at times seem to be taking over the playing fields and other grassy areas. Wild Turkeys are also spotted from time to time. Estabrook Park also features an excellent Disc Golf course. Disc Golf is a sport that can be played from school age to old age. It is one of the greatest and least expensive lifetime fitness sports available. At present it costs only $5.00 to play a round, or $40 to obtain a season pass that is good at all Milwaukee County disc golf courses. The sport of Disc Golf is played much like traditional golf except instead of a ball and clubs players use a flying disc. One of the best features that disc golf shares with traditional golf is that it is played in beautiful natural settings. Estabrook Park Disc Golf Course provides just that setting and can be enjoyed by the whole family.